As the clock ticks down, World Sailing will attempt to save themselves from complete ridicule and assemble something resembling competitive sailing in the 2024 Olympic Games. ailing undoubtedly needs to keep up with change, but change within the sport as it develops, not some half-baked, cobbled together format to add “media value” to the Olympic Games. When you turn-up or tune-in to the Football World Cup you expect to see football, as the game is played at all levels by football teams world-wide. Not that someone has moved the goal posts and you are watching a version of the game on a different sized pitch, to new set of rules, not played at any serious level anywhere! This is the position we are heading towards as World Sailing, the world governing body for the sport of sailing, attempts to get their pay-cheque back on track. In 2020 at Tokyo there will be seven dinghies, one multihull and two windsurfers. Meanwhile the core of the Games, the athletes are still running, jumping the throwing in the same track & field events! Sailing has removed big and then small keelboats to arrive at the present mix, focused on the most popular forms of competitive dinghies and boards. This despite the popularity of many small keelboat classes and long-distance offshore racing. For 2024+ the aim should be to refine this mix to continue to represent competitive sailing as practiced by the vast majority of classes that World Sailing claims to represent. Other Olympic sports or variants of those sports are regularly trialled, and some are added (or removed) as their popularity rises or falls. This is a continuing process in many sports and a process that World Sailing seems to find very difficult. 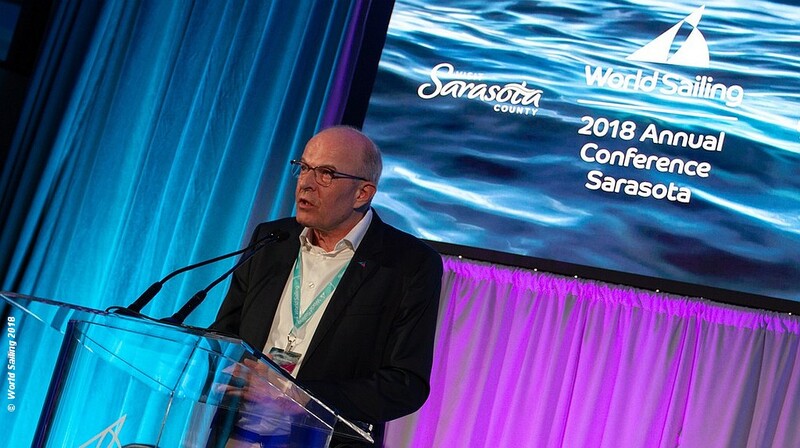 There will be many hundreds of representatives at the World Sailing Annual Conference in Sarasota, USA, toiling away at the minutia of various class, sailing and equipment rules, and many votes and decisions will be taken. And this very necessary work is what allows us all to compete at all levels of the sport from the smallest club dinghy race to the professional round the world racers. But for World Sailing the elephant in the room is Olympic Sailing. Without a presence in the Olympic Games sailing will suffer, but World Sailing is a busted flush. Over 60% of its income is derived from the IOC and allows it to continue as it does. The merest hint of its removal puts the very existence of World Sailing, in its over bloated present form, in danger of collapse. Some would see this as a good thing, that the governing body returns to is core function of administering the classes and the racing rules. Then a professional racing body be formed to control and grow that area of the sport for the professional sailors involved. World Sailing has tried to keep everything within its control, but with little hands-on experience has floundered and spectacularly failed, in a situation very much of its own making. We have now to see how they can save themselves and just maybe something we recognise as competitive sailing.